Plastic-Covered Linen “Antiquities” Purse. Early 1960s. Maker: Soure Bag New York. Linen or linen-like fabric bag covered in plastic (just like grandma's couch!) and featuring an antique store scene, with grandfather clock, bust, candelabra, dresser, mirror and armchair. Special touches have been added, like the fleur-de-lis on the bottom of the “Antiquities” shop, and a brass bead as the door handle. Some of the beads and faux gems have come loose and are floating around inside the bag, as if scattered on the sidewalk outside the store. Soure is one of my favorite designers and, right now, I’m pretty irked with myself for passing up another store scene Soure I saw online. Eh, well. I’ll get you my pretty… and your little pleather handle, too! 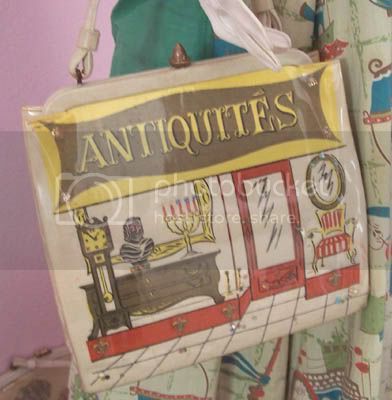 Just for fun, I’ve included a pic of Faith the Mannequin holding the purse and wearing a ‘50s dress made out of a cotton fabric that looks like grandma's kitchen curtains.